Mary trained at Goldsmiths College 1942-44, Bath Academy of Art 1951-52 and Goldsmiths again 1972-73 - 'Goldsmiths Diploma in Embroidery' and Selected Member of the Crafts Council Index (reselected 1984). She taught in schools and colleges. In 1973 she was invited as a Painter, Art Teacher and who had had her own Theatre Group, along with a couple of dozen other people from different backgrounds, interests and disciplines to attend the Experimental Puppetry Workshop held at The Central School of Speech and Drama. From this a group was formed, informally met, worked, shared and made together etc. resulting in a performance piece called 'Red'. From 1974 – 81 she was Senior Lecturer in charge of Embroidery Workshop for art and drama graduates and art postgraduates at Middlesex Poly/now Uni. During this time, she obtained a grant to set up a staff studio workshop (8 members experimenting) in integration of the arts using sculpture, puppet animation, film slides, music and sounds, exploring various schemes and historic precedent, resulting in performances. She retired 1981 in order to concentrate on her own work, exhibiting and selling and made a 'theatre Space' in her house where she began experimenting with her own work, coloured light, sound and movement. She also set up a working group Interartists which met regularly in her studio and continued to experiment with groups and individual artists from different art disciplines, such as the sculptor Oleg Prokofiev, amongst others. She created textile forms and wall hangings, using canvas, calico, cottons, silks, linen and string. Her work was exhibited by Anatol Orient and her work became known in Japan, featuring in two major exhibitions there. As a member of the Crafts Council, she had work in some of their exhibitions. 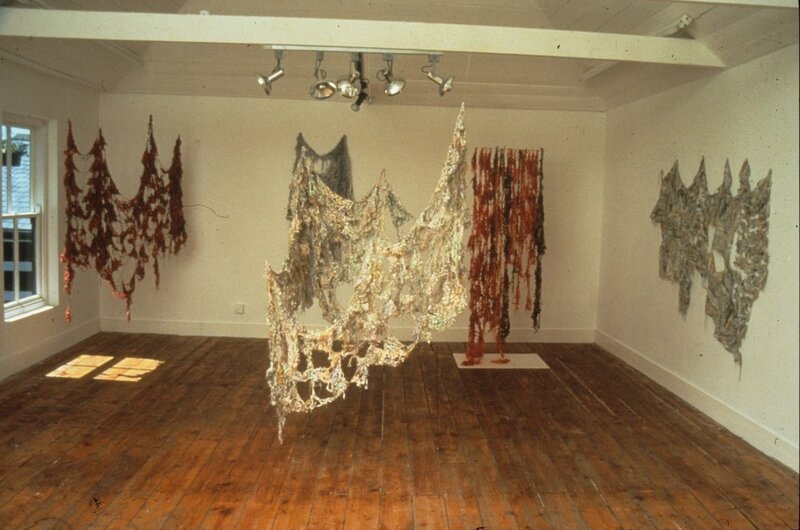 In 1994 she moved to Newlyn in Cornwall continuing to make, exhibit and sell work, becoming one of the Newlyn Artists. She became increasingly interested in experimenting, hanging/moving her sculptures in nature whilst filming and photographing them. Further details of Training, Teaching, Exhibitions, Articles, Workshops and Performance Pieces etc… can be provided. Mary Ball has work in both Private and Education Authority Collections in England and USA. She is Listed on the Cornish Artists Index. Early 1980's for an exhibition 'Embroidered Textiles'. She said she often felt like, an outsider not working within conventional methods or conventional boundaries. From the nearly 200 pieces of work remaining, we think her map, her record of her journey and pioneering spirit over 50 years, is worth showing and should be made permanently available for others to see. To discover more about Mary’s inspirations, along with details of the next showing of the artists works, visit the exhibition page. Below are just a few biographical photos of Mary, found in a time capsule we had the pleasure to have in our mist in preparation for bringing her work to life again.